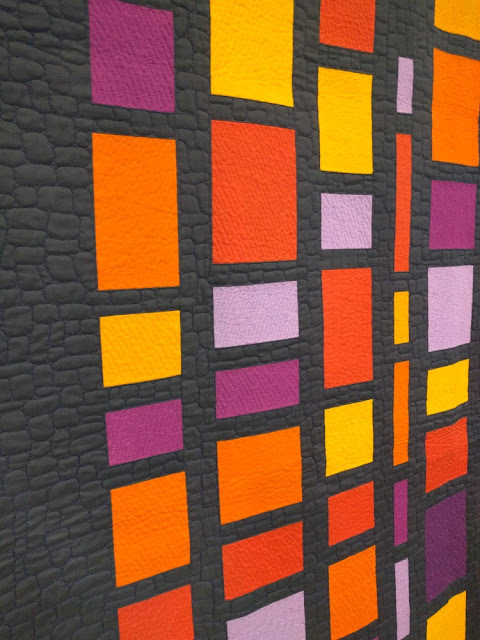 Today, I'm thrilled to share "Burst," my latest orange peel quilt. 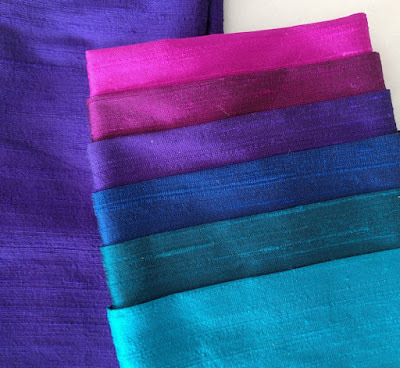 It was made for RJR Fabrics and their What Shade Are You? blog hop. I took on this project even though I have quite a demanding one going on right now; the design has been sitting in my sketchbook for ages, just waiting to be created. It was such a thrill to make a vision come to life! RJR provided the fabrics (thank you, RJR! ), and I've written about the whole process on their blog today. Click here to read the full post and see more pictures! Plus, if you'd like to win a bundle of Cotton Supreme Solids like the ones I used, check out my Instagram and RJR's, too (there will be two winners!). Happy news! I've been working on a quilting book with Stash Books (C&T Publishing) for the last few months. If you saw me at QuiltCon or are a member of my guild, you might already know, but I wanted to announce it publicly here for a few reasons. First, I'm really excited! Unfortunately, I can't talk about anything content-related until 2018, but I promise I'll explain more then. That seems a long time away, but it really isn't (scary for me!). Second, as you can surely imagine, writing a book is a h.u.g.e. endeavor, and it is, quite deservedly, taking up a significant portion of my free time. So far, I'm loving the process and I'm thrilled to work with the helpful staff at C&T. I've also lined up small projects to give myself some "fun" sewing (though so far, all the book sewing has been really, really fun). For the next few months, blogging will be a little less than usual sometimes (like the past couple of weeks). I want to be clear about why since some have noticed I've dropped off the radar a bit. I've also decided to hold off on a summer quilt-a-long for the first time in several years; I'll be finishing up the book and moving house all at once, so even though I have a couple enticing QAL ideas, those two endeavors are main priorities! 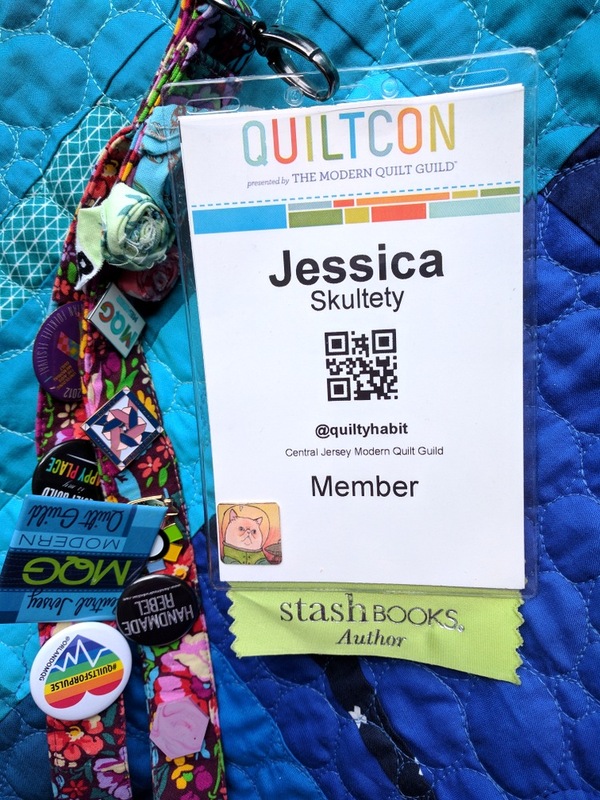 I hope to run a fun QAL in the fall, though (we'll see - if not, January). The Wonky Press will run as usual, 2x a month (1st and 15th day). Why did I decide to write a book? Several reasons. As a traveling quilting teacher and lecturer, it often crosses my mind that it would be quite swell to have my own book in tow. Not just to sell (yes, money is an important part of what I do) but also to engage my students and have a physical reference that contains my own work and methods. These are the main reasons I've decided to sign a book contract. I want to help quilters and grow my business! The other reasons are, as follows: I have some ideas I want to share in an official way. I've always wanted to write a book (never did I imagine it'd be on this subject, though; my 10-year-old self always imagined I'd be a novelist). I love to sew. I love to teach. I love to write. All of those things combined. How did this all start? I'd thought about it for awhile but decided to build up my classes and lectures first before pursuing anything. Roxane at C&T contacted me a year ago (I can't believe it's been that long), and I wrote up a proposal. Then, I signed a contract in November. I've been sitting on this news for a while. :) Those of you that have known - you've been so supportive. Thank you. 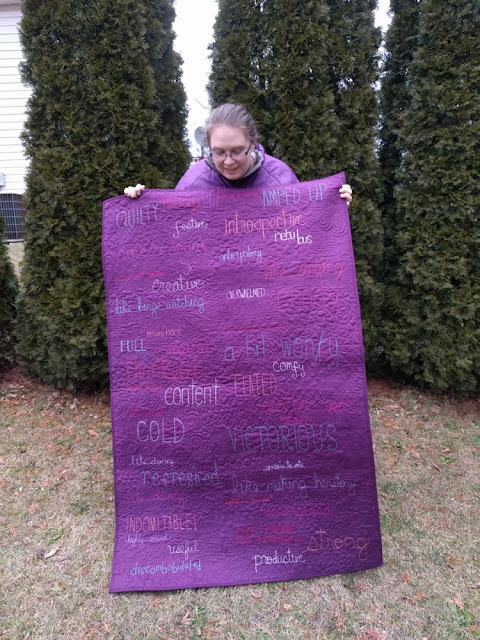 Surprisingly, I *do* have a large quilt finish to share later this week as part of RJR's What Shade Are You? 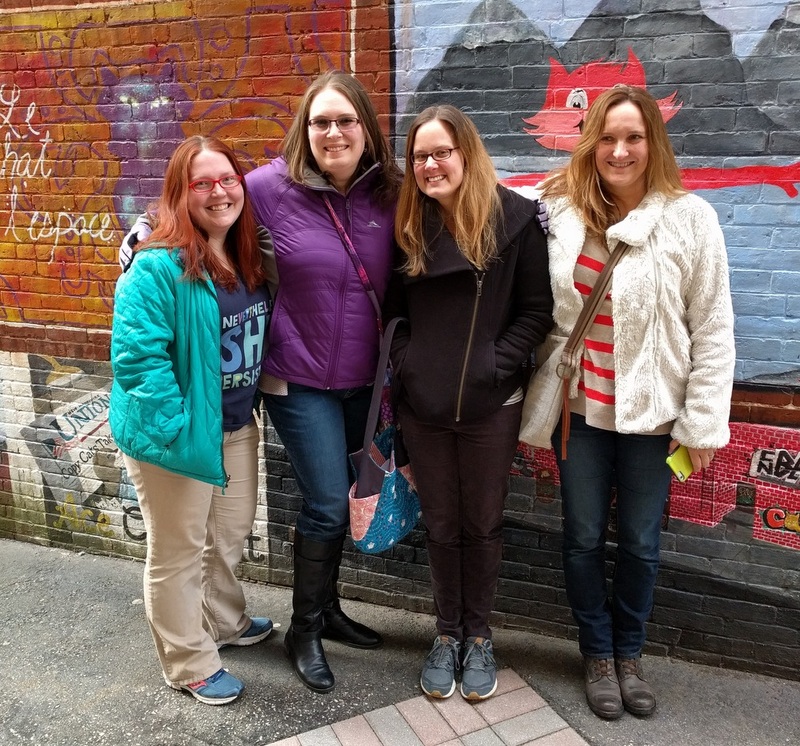 blog hop (sneak peeks above). I'll also be attending and teaching at Mid-Atlantic Mod quilting retreat in Lancaster, PA this week, and I hope to have a recap next week all about it! This Wednesday night, I'm thrilled to share the process, inspiration, tips, tricks, and tools behind quilting words with free motion quilting. 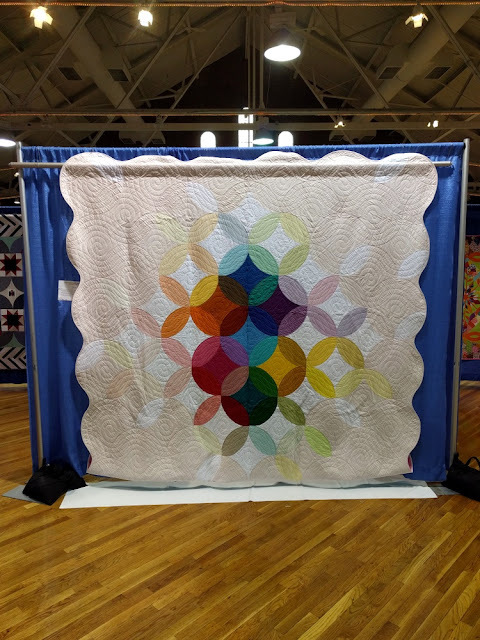 The Modern Quilt Guild invited me to give this presentation, and I've been preparing for months! There are so many reasons why one might choose to write on a quilt, and hopefully you'll leave ready to try it out. I'll also provide resources exclusive to this presentation. 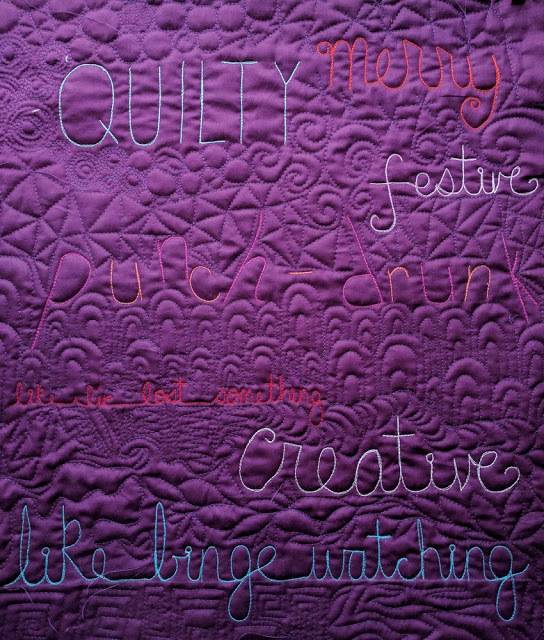 #quiltingwordswithfreemotion <--share your progress here! The webinar begins online at 9 pm EST. Once you've registered, you should receive a link to the webinar. If you can't make it at 9 pm, the webinar will be recorded and available for MQG members to view later, for free. I'm also developing a 3-hour class around this topic, so if a guild is interested, let me know. Hope to see you there! Related: 5 Tips for Working with 40 and 28 Weight Aurifil Thread, which I compiled through making my wholecloth quilt, Today I Feel. This is "Today I Feel," my first large wholecloth quilt (I'm hooked - there will be more!). She's got a story; some of you might already know parts of it, as I blogged weekly about the process and shared on Instagram (links are below). 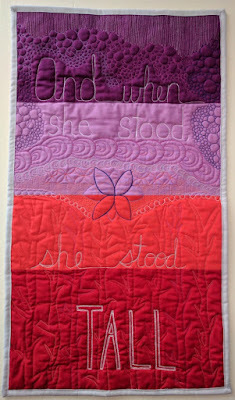 My recent solo exhibition added a new layer of meaning to the quilt, too. 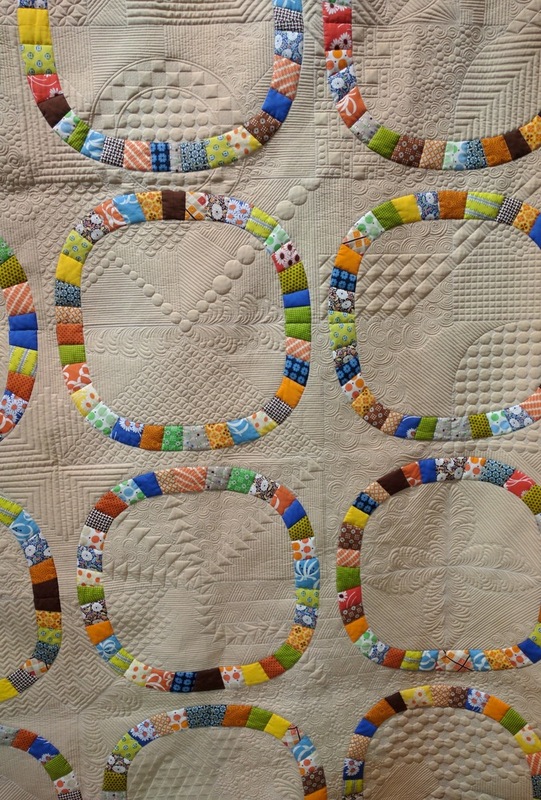 It's interesting how a newly-made quilt has a purpose and that purpose changes throughout its life. 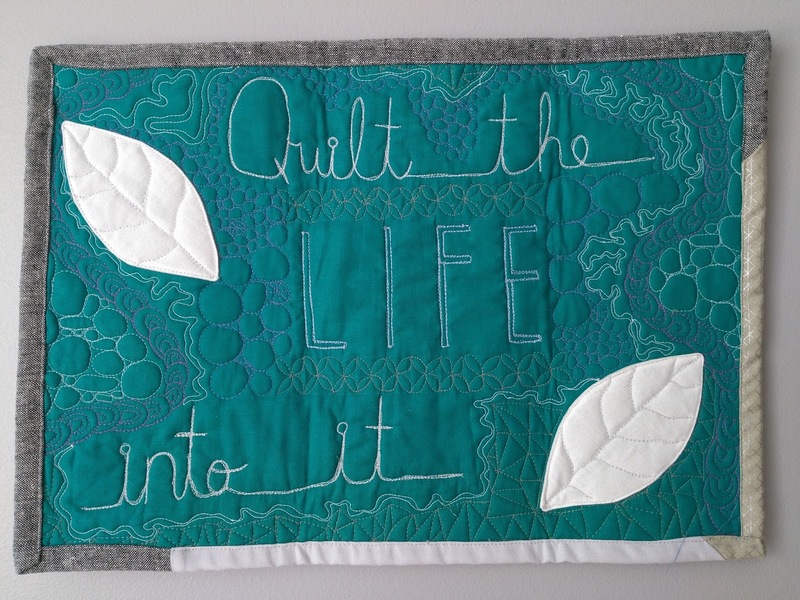 The purpose of this quilt was to force me to quilt every day, even just a little bit. 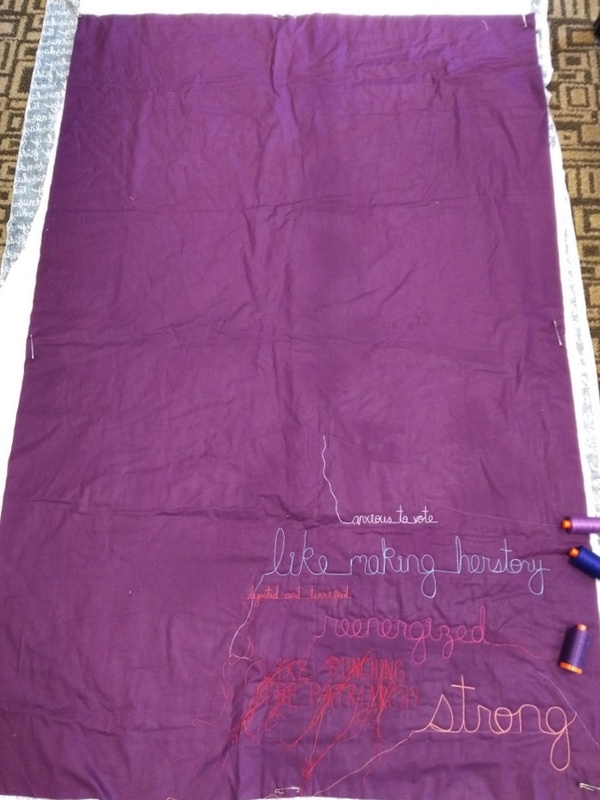 An idea came to me last November: what if I treated a quilt like a diary? 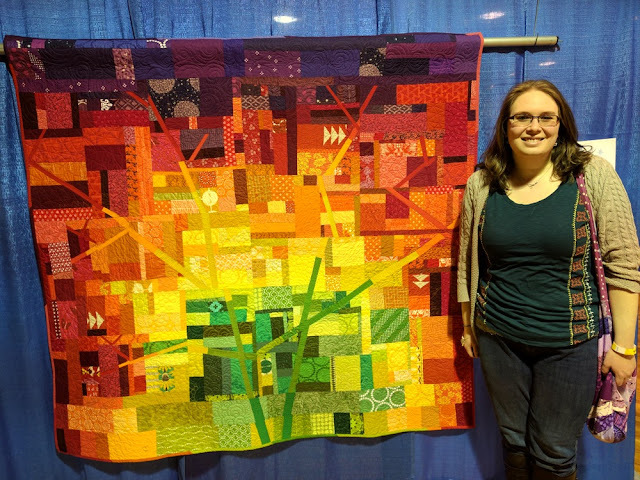 The majority of this quilt was made over the course of 6 week. Every day, I wrote to finish the phrase "Today, I feel..._______" in four words or less. 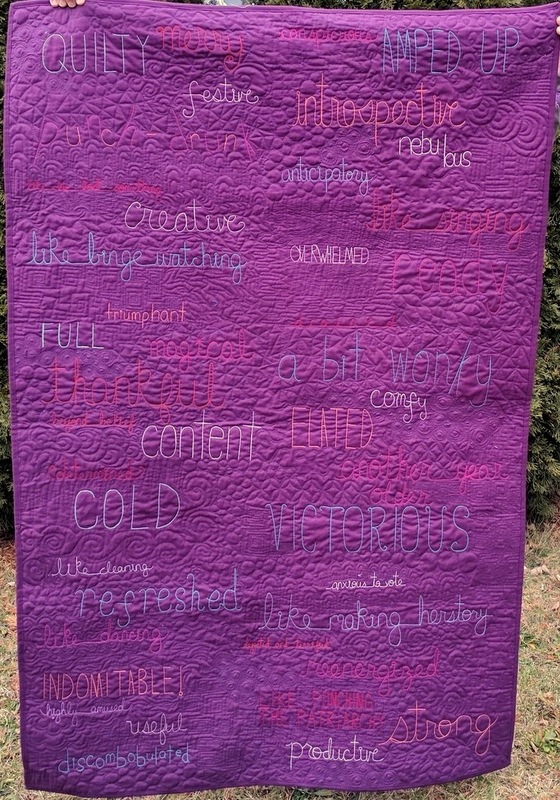 On Sundays, when I had the most time, I quilted the background of the phrases I had written the week before. It was like starting on a clean slate on Monday. 1. Quilting around the words in a improvisational manner and letting the words influence the background. Example: around "overwhelmed," I quilted sharp, dense lighting bolts. "Punch-drunk" - which you can see above - is surrounded by wacky triangles. 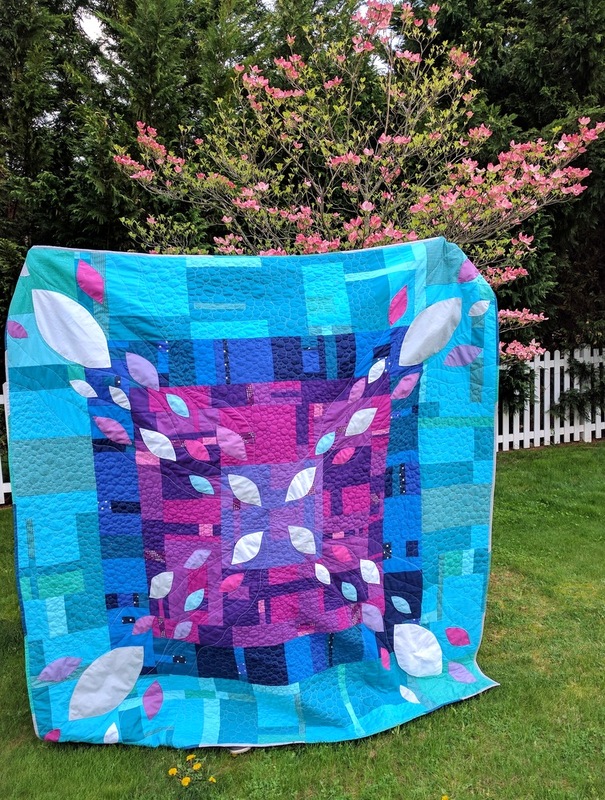 Truly, the background is what really brings this quilt to life. 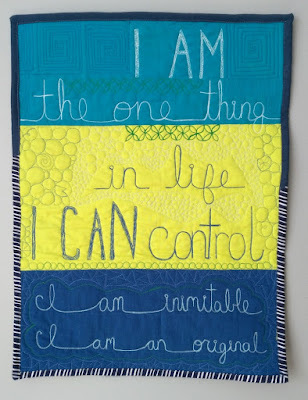 I used a blending thread (Aurifil 4225 50 weight) so that the words would pop, but the texture would show, too. It feels like so much more than the words. I super-edited this photo so you could see the texture. 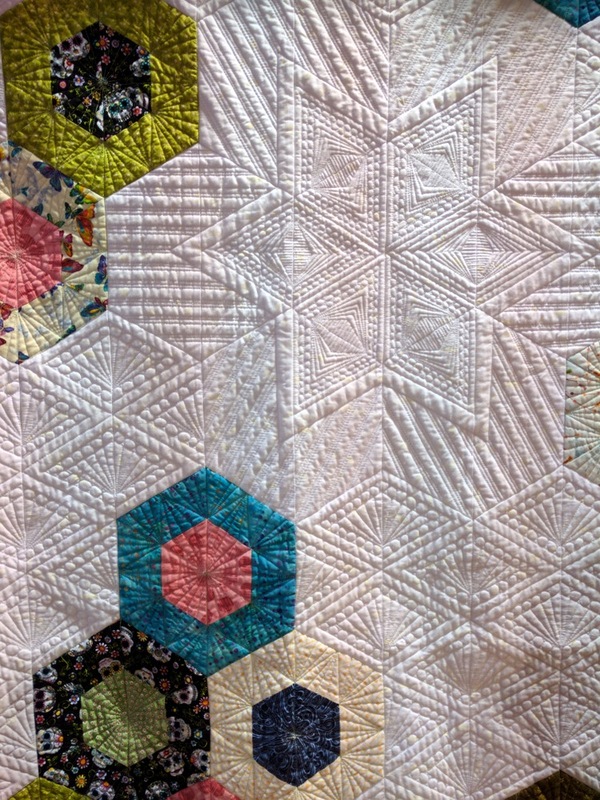 It's such a hard quilt to photograph! It feels like forever ago that I started this project, right before the U.S. election. I felt like either way, I'd have strong feelings to project that week. 2. Sharing the project with you. Every day, I posted the reasoning behind my choice of words on Instagram under the hashtag #todayifeel (if you click the hashtag, you can read all the stories). 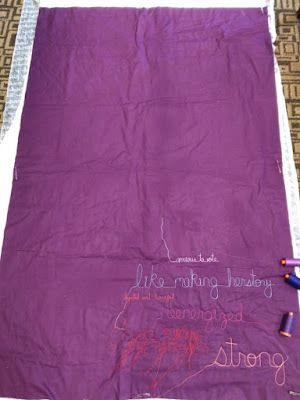 I also shared much more of the process of making the quilt in blog posts: Week 1 (inspiration and goals), Week 2 (how I write words on a quilt), Week 3 (using contrast), Week 4 (scale), and Week 5 (logistics/looking back). 3. Changing fonts, thread colors, and weights depending on the day and word(s). Any wholecloth quilt depends on threads the most! 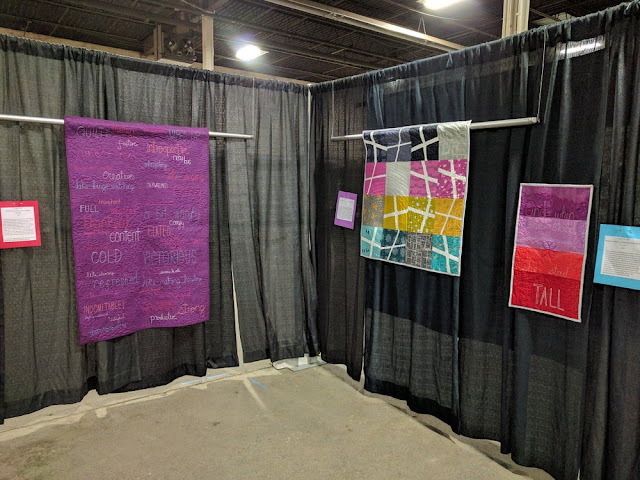 These were generously sponsored by Aurifil Threads (thank you, Aurifil!). I purposefully chose thread colors that would both contrast and fade, and used many different weights to experiment with how they showed up on the background. 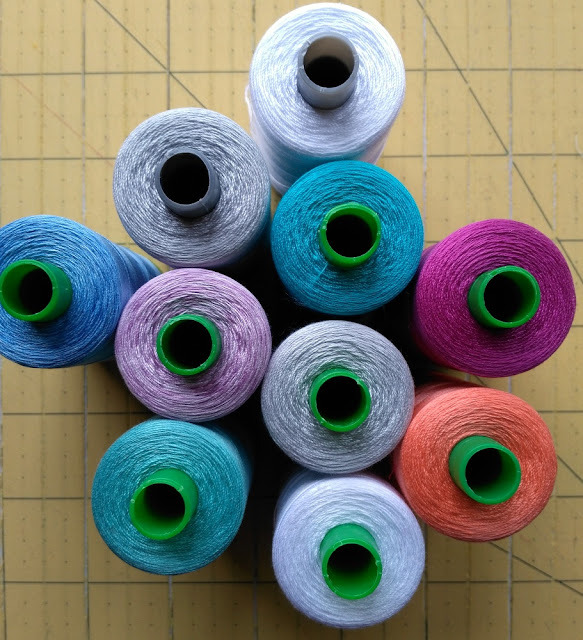 After much trial and error, I wrote this post to help others ("5 Tips for Working With 40 and 28 Weight Aurifil Thread"). Recently I had the opportunity to debut this quilt in my solo exhibition at the Quilt and Sewing Fest of New Jersey. Traditional quilters seemed to take an interest in it, probably because it's quite different from traditional wholecloth quilts (see below for more about this). Out of all 20 quilts on display, I received the most questions and comments about this quilt. 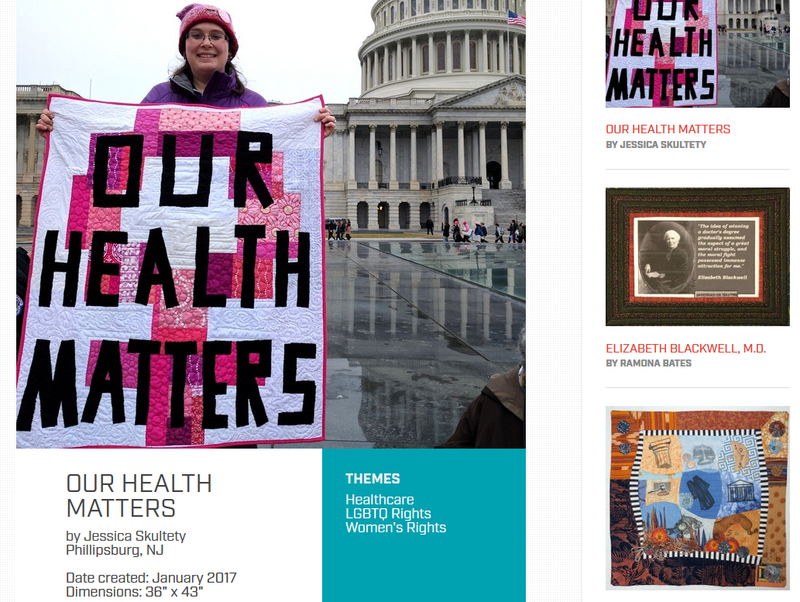 One of my friends touched me with her story: she and her daughter had the opportunity to view the quilt and discuss it in light of the election and the Women's March. 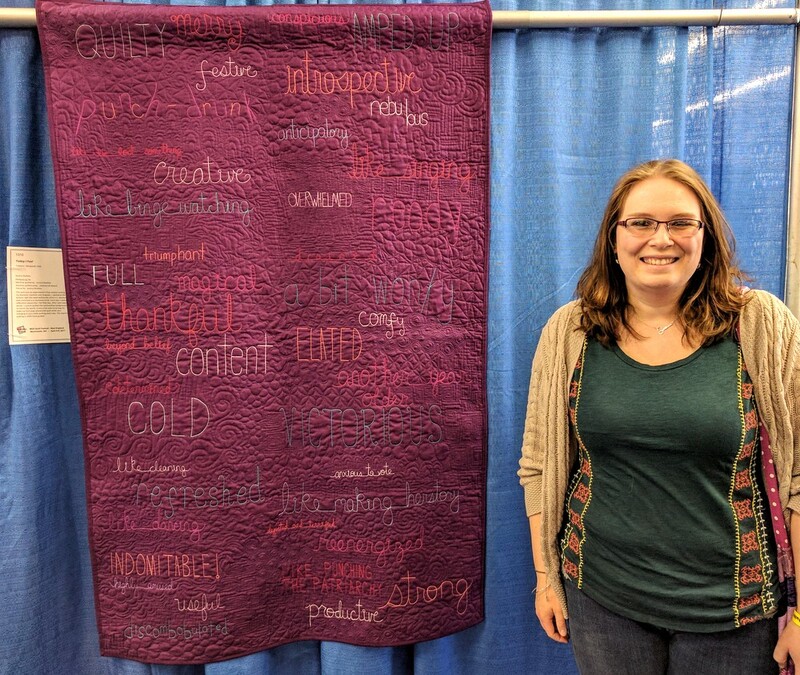 The quilt has been fulfilling to me in a lot of ways, and it was so wonderful to hear that others connect with it, too. 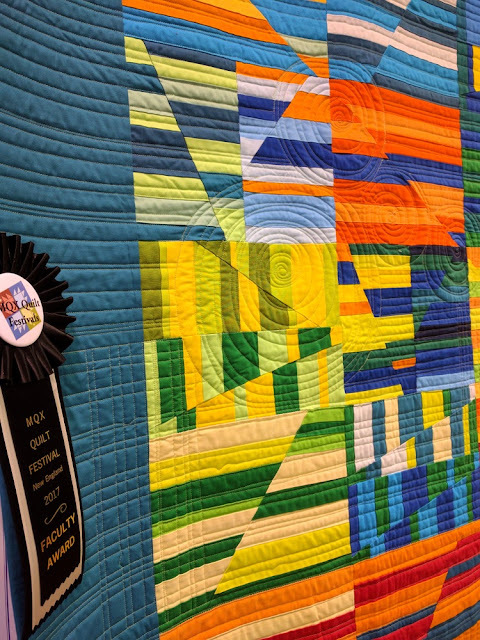 This quilt is currently hanging in the Wholecloth Quilt category at MQX New England in New Hampshire, and I'll be there on Saturday! It will be great to see it hanging with more wholecloth quilts. I'll be sure to report back! 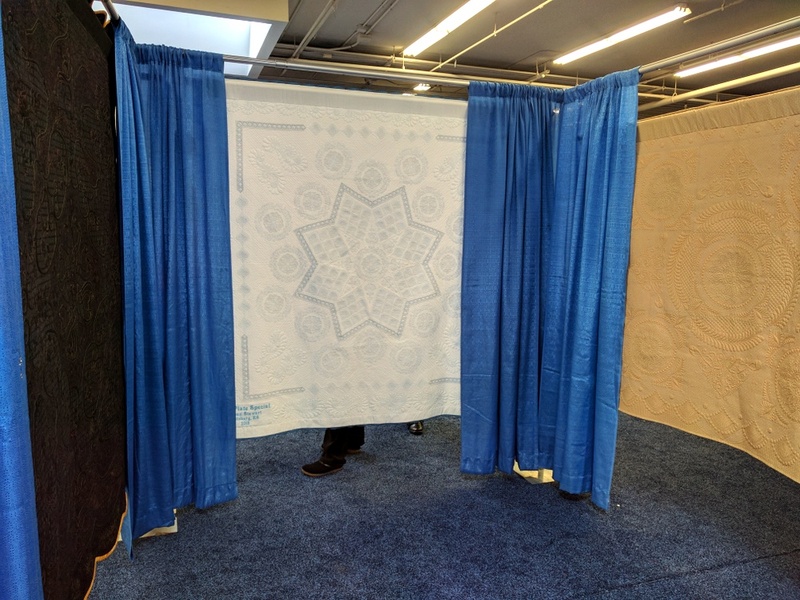 For the last year, I've contemplated the idea of "modern" wholecloth quilts. 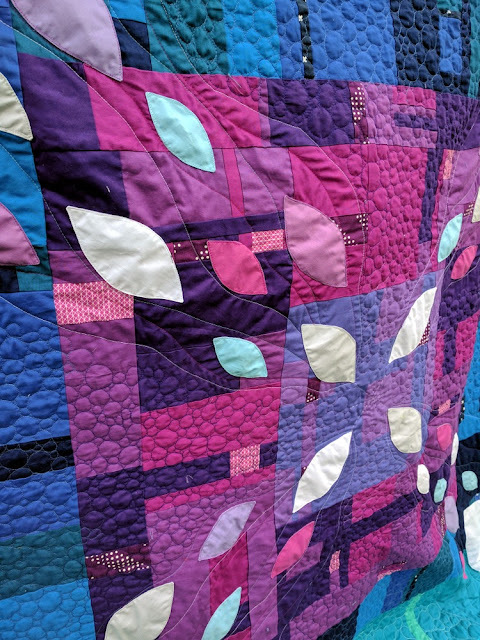 The main idea of any wholecloth quilt is take one piece of fabric and quilt it. 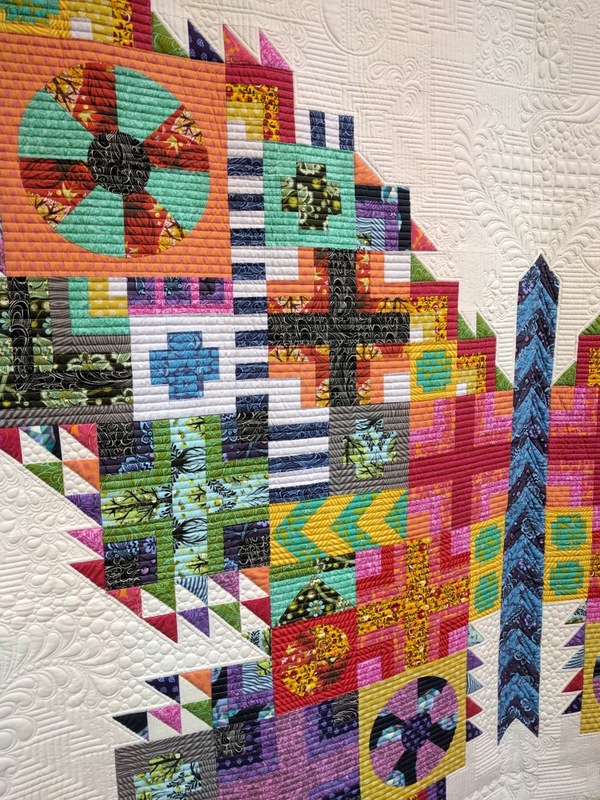 The design is based in the quilting alone. 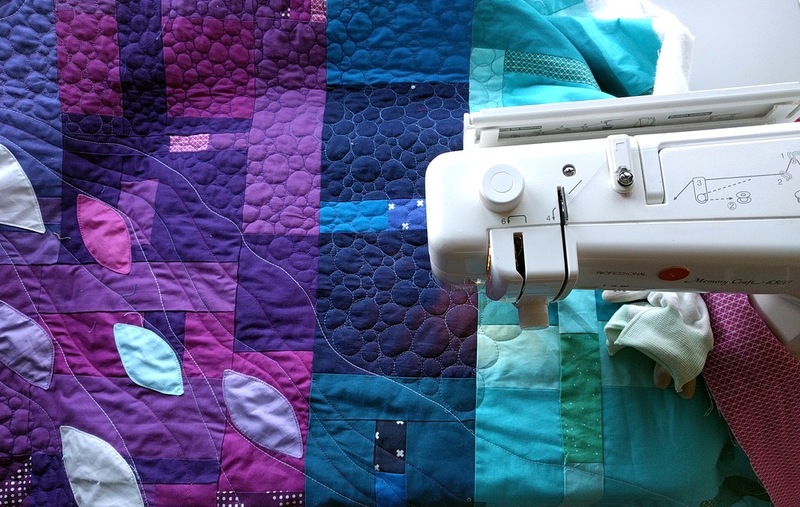 No piecing - unless it's to discreetly piece together parts of the same background fabric to make a larger top. It was actually quite unnerving to set up my quilt without any piecing (except for the backing)! Yeah... I matched my quilt. It was unintentional but not totally unexpected (90% of the time I'm wearing purple). 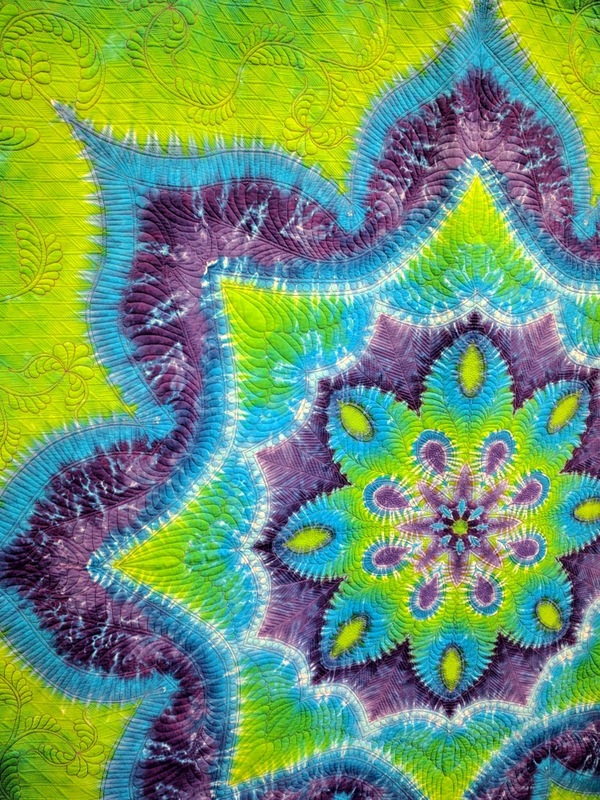 Traditional wholecloth quilts have a history of being ornate and extremely detailed. 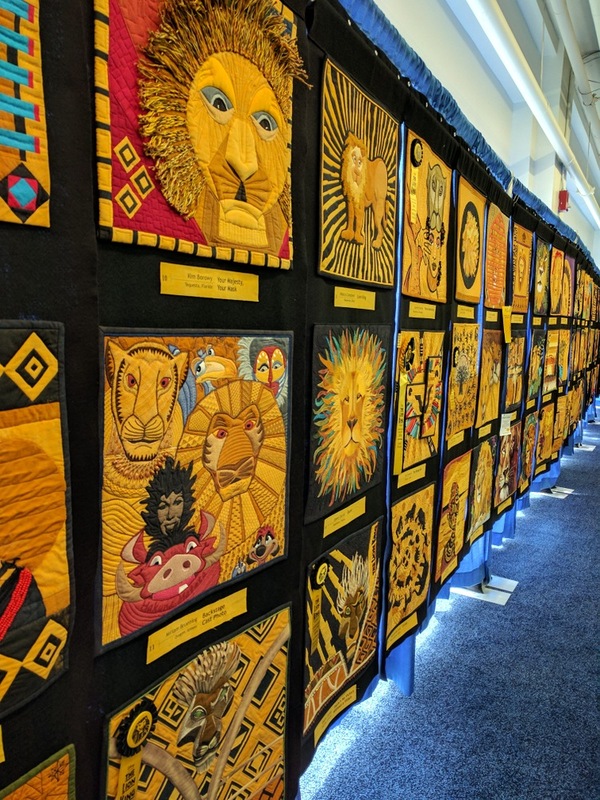 Often, they appear as medallion quilts, featuring a central motif and surrounded by intricate, symmetrical designs. Check out a few here in the National Quilt Collection by the Smithsonian. I also love the idea of quilting up a gorgeous printed fabric or panel, like this one from around the 1830s, owned by the Vermont Historical Society (by the way, if anyone has a good book about the history of wholecloth quilts, let me know - I've been trying to find one). "What Burr Said" and "Note to Self" - my other two almost-wholecloth quilts and completely wholecloth quilt, "Quilt The Life Into It." 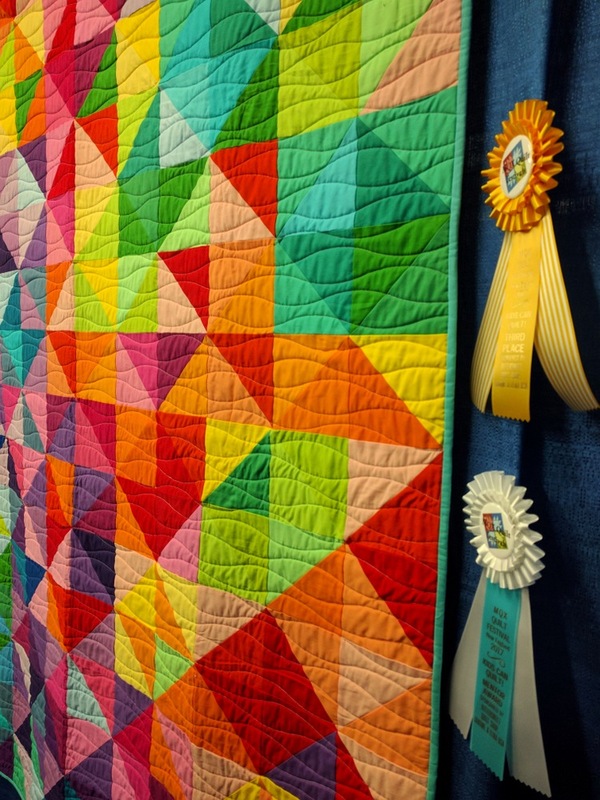 So, the question is, what is a "modern" wholecloth quilt? To me, it's one that contains lots of contrast and color changes with thread, plus asymmetry. I'd really like to keep exploring this further. 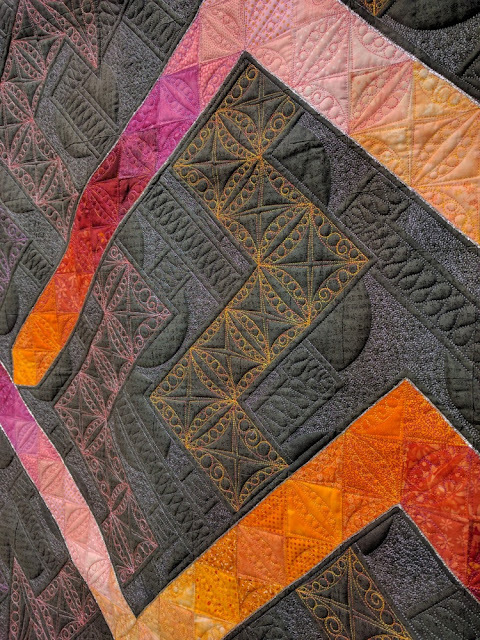 Finally, I'm excited to present a free webinar for Modern Quilt Guild members in 2 weeks! 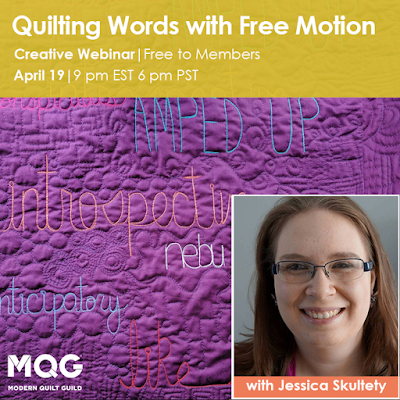 I'll be elaborating further on how to quilt free motion words on your home machine (or longarm). It's for all levels and it's going to be so much fun! Members can follow this link to sign in and register. All in all, it's a relief to finally share this finish in its totality! I don't know if I'll ever do an experiment quite like this again (never say never, right?) but I do have a lot of word quilts planned. Have you ever made a wholecloth quilt? If not, would you? Why or why not? Linking up to Fabric Tuesday, TGIFF, Crazy Mom Quilts, Needle and Thread Thursday.